Here in the States, we bring home the bacon, cry over spilt milk, and take it all with a grain of salt—all food idioms that are as American as apple pie. But we’re hardly alone in sporting a food-dominated vernacular. In Germany, for instance, to “add your mustard” is to inject an opinion, and “having salt in the head” in Croatia isn’t a medical emergency; it just means you have a seasoned mind. 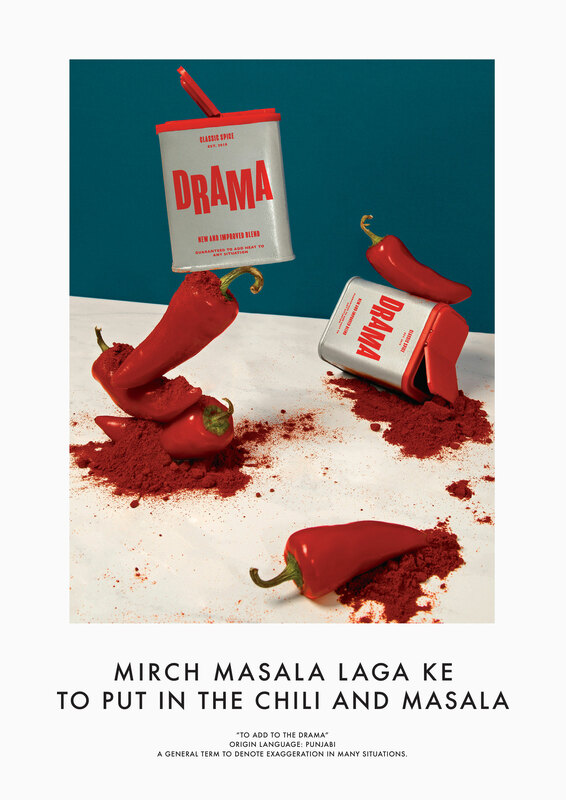 In their punnily titled photography series “Feast Your Eyes,” Adobe Creative Residents Isabel Lea and Aaron Bernstein conjure bold-color visual metaphors for different food sayings from around the globe. Isabel told us about how they researched the idioms, their creative process, and why food—especially when paired with uniform design—feeds multicultural understanding. How did you discover and research the idioms? With all the “Feast Your Eyes” project iterations me and Aaron do we try to make sure its underpinned by real insight and research. The process for this was a little unconventional, because we were collating something integrated into people’s everyday experience. We found the best [approach] was to ask questions to the people we knew to get an understanding, and then ask for idioms from a wider international audience via social media and forums to mine a collection of phrases. Most of these idioms were so intrinsic to the culture of the people we asked they didn’t think of it as special, interesting, or distinct. This insight helped fuel the importance of our project. To 'drink vinegar' is 'to be jealous.' Language of origin: Chinese. We also discovered you could group these phrases in different ways, such as proverbial, adjectives, action-based, etc., and that some themes were more common to certain cultures. For example, we found that a lot of Eastern food-related idioms were much more proverbial in nature, while a lot of Western countries made literal substitutions for food as other objects. There were also common food themes within particular countries, teaching us something about their food habits, such as how Hindi phrases use a lot of mangos “wind-fallen mangos” are something easy or cheap; a “mango at the price of a stone” is a good deal; a “ripe mango” is a very old person; and “to have mangos and sell the seeds” is to have it all). And many foods transcended different languages in their popularity, such as milk (“mala leche” meaning bad milk or bad mood in Spanish, “no use crying over spilt milk” being common in English). Having 'salt in the head' means being wise or knowledgeable, in the Croatian idiom. How did you stage and edit the photographs for “Feast Your Eyes”? My background is in graphic design and typography, and Aaron’s is in photography, but we both have experience conceptualizing and art-directing projects. For the conceptual stage, we thought about which food items to use and how to subvert them to visualize the idiom. We settled on a removed, mid-century aesthetic for the overall visual direction in order to create a space removed from the cultural norms of each food. This creates a distinct space where the food and props would be recognizable and understandable to people of all different cultures. Then we worked remotely between the UK and US but in collaboration, myself on designing the products and Aaron on the photography direction. We then met in London in order to shoot the project together. The sets were all physically built rather than relying on Photoshop, so this involved a lot of refining the sculptures of food and packaging. 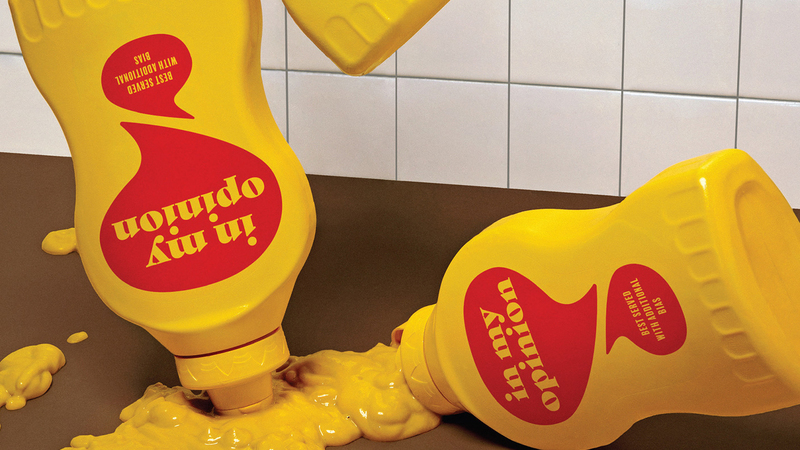 You can particularly see this in the German “mustard” visual, where we balanced bottles together to visualize too many opinions in a discussion. The packaging itself was designed to work as a clear prop element, allowing us to be playful with the way we crafted the scene and integrated food. From there, we shot a few variations and made our selects and edits based on how well the images communicated the phrase and how they worked together as a series. 'To throw peas at a wall' is a Polish saying that means to waste one's effort. 'Bad milk' is associated with a bad mood in Spain. Was there a concerted effort to choose a multicultural or food-related project? Any plans to keep the series going, or anything else in the pipeline for the residents? For the Adobe Creative Residency, my focus is on language and Aaron’s is food. We found an interesting overlap in this space of food culture, and how the way we talk about food can teach us about socio-cultural themes. It seemed a natural fit to explore the idea of food idioms, something that intrigued us both—especially as we both speak English, but idioms are different even between the US and UK. We still have many un-visualized phrases in our database which we’d like to bring to life. However, aside from this, the process taught us how much there is to explore within this intersection of food and language, so we plan to expand our project. We’re currently working together on an editorial piece exploring a different aspect of language and food, which also includes more academic research. We hope that we can continue to work with “Feast Your Eyes” as an ongoing collaborative project within this space for a long time. See more photography and graphic design stories in Sixtysix.